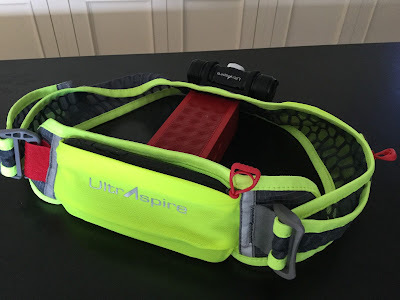 Road Trail Run: Review Ultraspire Lumen 600 Light Belt & Pelican Progear 2780 Headlamp-New Ways to Get Light Where You Really Need It on Road or Trail. Review Ultraspire Lumen 600 Light Belt & Pelican Progear 2780 Headlamp-New Ways to Get Light Where You Really Need It on Road or Trail. Road Trail Run takes a close look at the Ultraspire Lumen 600 reflective waist belt with high power LED light and Pelican 2780 headlamp with a downcast and main lamps. 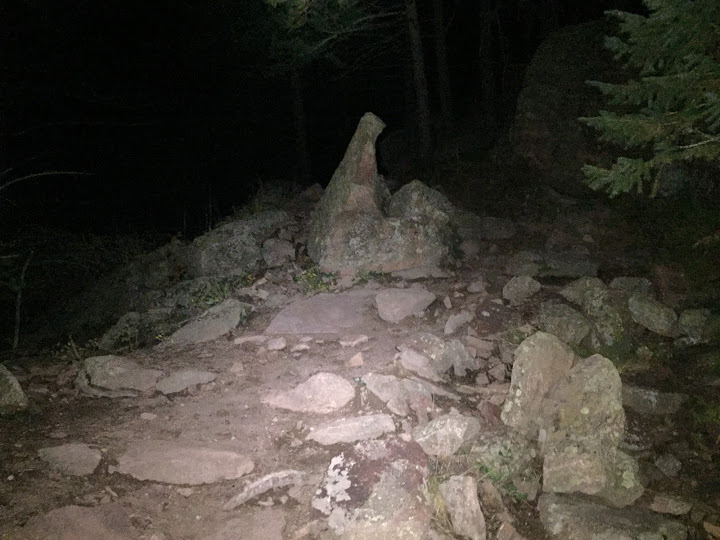 Jeff Valliere an accomplished mountain runner night tested them on rugged trails above Boulder, CO.
Editor's Note: Run lighting technology has improved by leaps and bounds the last several years. Sort of like Moore's Law in computing with dramatic increases in LED output (Lumens), computer and sensor control, USB charging etc... So if your headlamp is 5 or 6 years old and you run or hike at night a new light will most likely be helpful. The lights below likely have between 4 and 6 times more light and likely equivalent or better battery life than your old one. In addition to output, etc... innovative companies such as Ultraspire and Pelican both reviewed here, and Petzel with their RXP and Nao (not reviewed here) are directing light in new and effective ways for runners, not only far and wide, but also closer to the feet at the same time and with less tunnel effect. I had never tried a waist belt style light and was eager to give the Ultraspire Lumen 600 a test, with its versatile and widely adjustable belt, handy pockets and secure comfort, not to mention the advertised 600 max lumens, the Lumen 600 was at the top of my list. 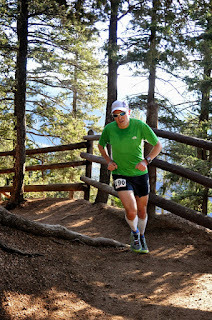 Ultraspire makes top notch run vests and hydration products used by many elite ultra runners so I expected something special from them. 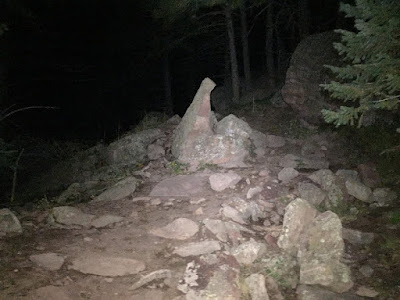 When running at night, I almost always use a headlamp combined with a handheld in order to have a bit more contrast, which is especially helpful on the rocky, technical trails that I frequent, so the prospect of having my hands freed up was quite appealing. 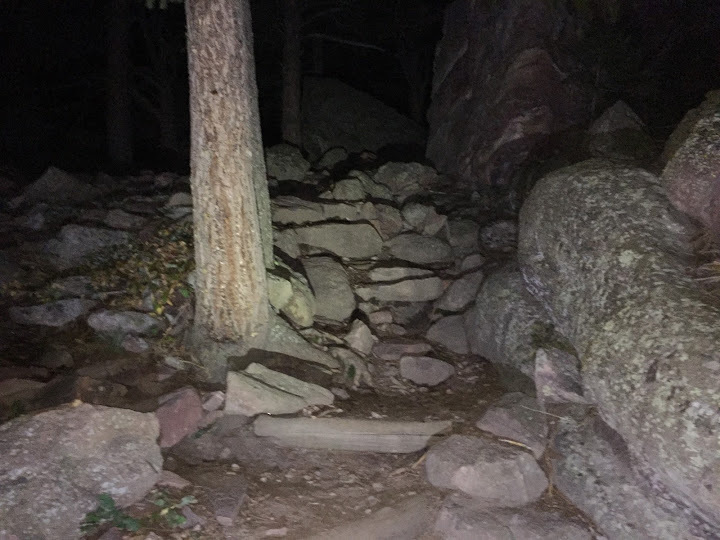 I was able to get in some great testing on a variety of terrain here in the foothills above Boulder, Colorado, the highlight being a run on the in your face steep Fern Canyon Trail on Bear Peak, which rises 2,100 feet in just over a mile, topped off with a short class 3 scramble to the true summit. 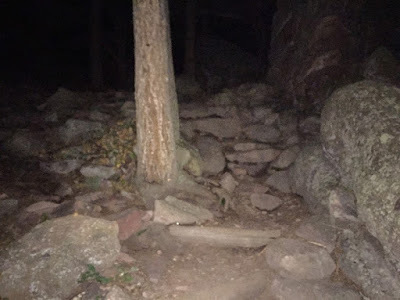 On the ascent, I kept the light switched to the medium setting, which I found to be ideal for ascending such steep terrain at relatively lower speeds. The low setting was plenty adequate if you really needed to stretch battery life over a full night (or nights) and the highest setting was a bit too blinding for ascending such a steep trail. I like that I can rotate the lamp up/down to suit my needs/preference, but did find that there was a point where the light could be angled up a bit too much and was a bit of a visual distraction (though this was only a minor factor ascending steeper terrain). On the highest setting, this light really can project an impressively distant beam for distant navigation. Note the increased shadows and contrast around the rocks in the High setting picture. 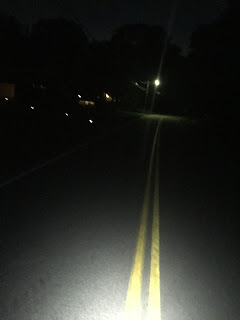 On the descents, I kept the light on high, as I am typically a bit of an off balance stumbling fool at night, but this particular light put out such a powerful, warm, yet not overbearing beam, that I was able to run with the same speed, confidence and agility that I would normally have during full daylight. Physical bouncing of the light on the technical descents was noticeable, no matter how much I snugged the belt on my waist, but was not overly annoying or distracting. 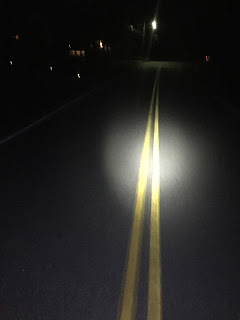 The bouncing increased as I upped the pace, but I found that my perception of the light bouncing could be mitigated a bit by also using a headlamp. I was impressed at how light, unnoticeable and comfortable the belt is and also impressed with how it stays securely in place (despite the actual light shaking a bit). I noticed with the Lumen, and this is not a complaint, simply an observation, is that on steep and rugged terrain (both going up and down), my knees occasionally got in the way of the Lumen and created a shadow, where, without the supplemental light from the headlamp, could cause momentary disorientation and perhaps a fall. I only got this on the largest step ups and larger jump downs on the descent. 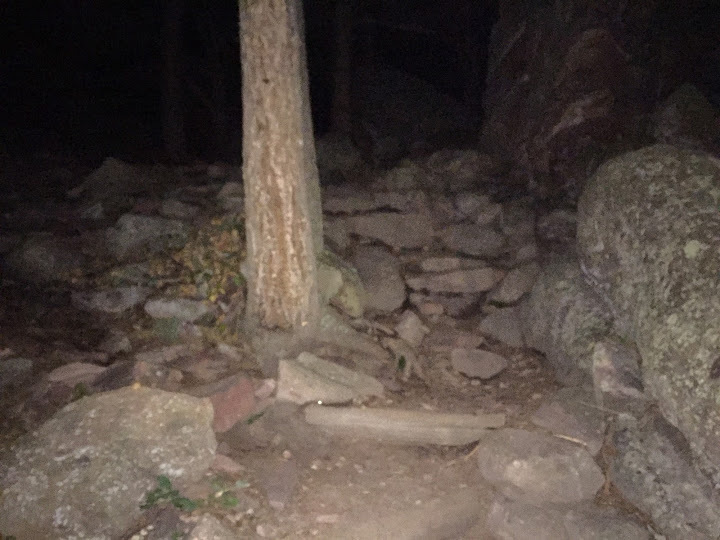 Keep in mind, this was happening on a segment of trail that gains 2,100 feet in just over a mile. 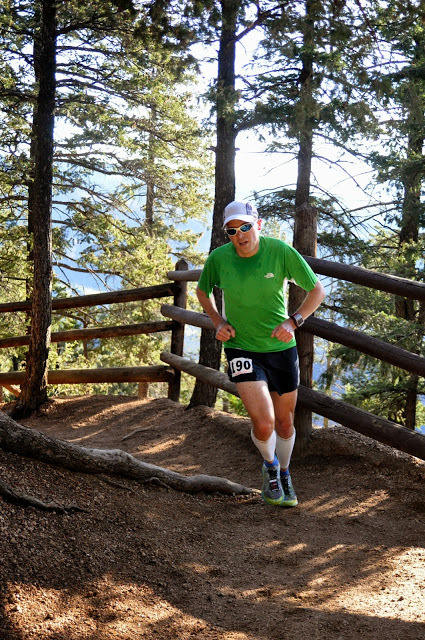 On less steep trails (which is most other trails) or road running, this would never happen. There are two zippered pockets, each with large red, easy to pull tabs, one small pocket on the front side and another larger pocket at the rear of the belt. The front pocket is appropriately sized for a car key or extra battery, where the rear can accommodate several gels, or a smaller phone. I tried to fit my iPhone 6 in Lifeproof Fre case and had no luck, but Sam was able to barely fit his iPhone 6 in a different case and I am still mystified as to how he pulled this off. (Editor's Note: I use a Pelican Voyager case which is shock and dust resistant with a baggie for water resistance). I was however able to easily fit my wife’s iPhone 5s (also in a Lifeproof Fre case) into the rear pocket, which fit well, though there was no extra room for anything additional. I was also able to easily fit my palm size Canon Elph digital camera into the pocket, with plenty of room left over for several gels. The singular button on the side of the light serves a dual function to turn the light on/off and also cycles through the 3 brightness settings and 1 strobe. The button can be easily operated with glove liners, or even medium weight gloves. Even with bare hands though, I found it a bit tricky to accurately cycle through the brightness levels without accidentally switching the light completely off. I got a little better at it with practice, but still inadvertently turn the light off about half of the time. While I appreciate the single button simplicity, a separate on/off switch would be an improvement in my opinion. Another area that could use improvement is the battery charging process. My first time charging the light, I was not sure that I had the proper micro USB charging cable, as with normal pressure, I was not able to easily insert the cable into the charging bay. I knew that it was compatible from a connection standpoint, but the port itself is a bit too slim to fit well with the provided cable (or even with another (theoretically) compatible micro USB charging cable I had at home). With some wiggling and finessing, I was eventually able to insert it enough to activate the red light that indicates that the light is being charged. It almost seems to me like the seal here is intended to be waterproof, but I can’t see that being an advantage when charging the light at a computer or in the car with a car charger. I also did not like that even though the cable is a common style, you are dependent on this specific cable only because of the specific fit. This was especially relevant when after my 3rd charge, I damaged the metal cable head when unplugging the cable from the light (it gets really stuck in there and the wiggling action to remove bent the metal connector). I was able to manipulate the cable head back to working order (I think), but I am certain that it will soon need to be replaced. In addition to the cable issues, I found that actual battery charging is time consuming, it takes many hours. When I received the light, I charged it fully (until the green indicator light comes on), but did not use for a few days. Before my first night run, I figured I would double check to be sure that the battery was topped off and it ended up charging for over an hour until I saw the green light (was stored at room temperature and not used over those few days). On the flip side however, the battery life on this light is quite impressive. I used the light on mostly high one evening for 4.5 hours, then turned it on at 6:30am the following morning (on the highest setting) with the intention of seeing how long it took to drain the battery. Throughout the day, it progressively (yet slowly) dimmed, but was still shining enough in the evening to navigate outside in the dark. When I went to bed at 10:30pm, it was still kicking and eventually wore out in the middle of the night. 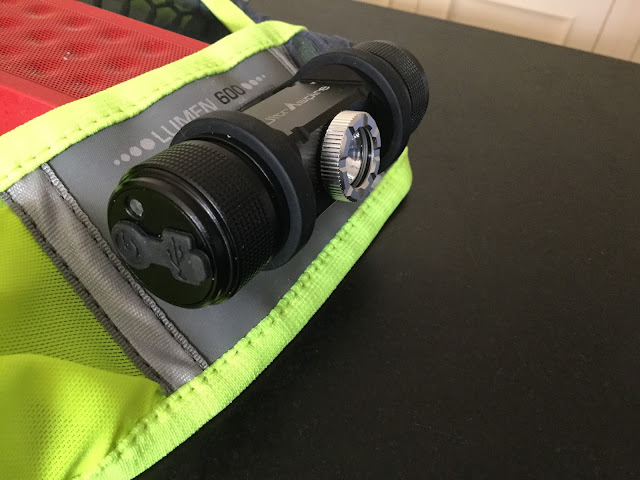 Editor's Note: The Lumen's aerospace aluminum light can also be easily removed from the substantial elastic mount and used as a light in the center tactical light. In summary, being able to have that extra light at waist level, while having my hands free is a huge advantage, not just to be able to have both hands available for other tasks like gear adjustments, camera/gps/phone operation, using poles, eating/drinking, but I found it that it was quite advantageous to have both of my hands free to balance and also to grab onto trees and rocks on really steep trails. I had not even really thought of this aspect until I actually tested this light, as I did not realize how much holding a handheld light can distract me. 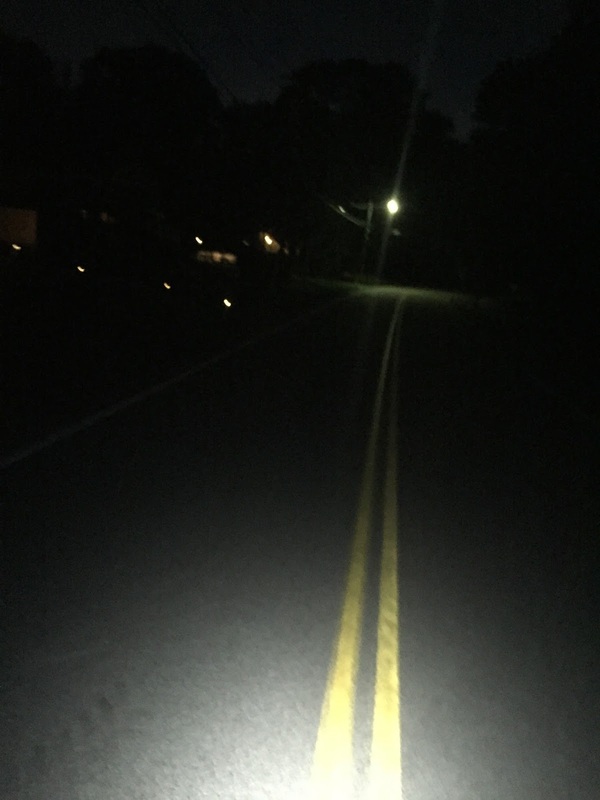 The Lumen 600 is an exceptional light despite the battery charging concerns and I would highly recommend this for anyone looking for hands free illumination for a wide variety of nighttime activities. The aircraft-grade aluminum housing is water, dust, and impact resistant. Tempered glass lens for clarity. 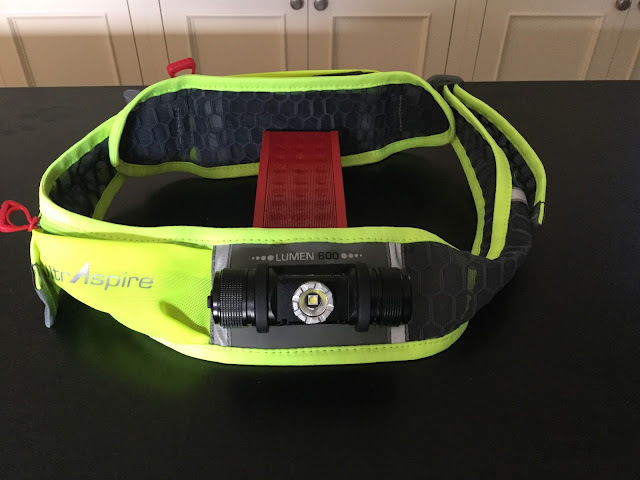 Same highly visible and reflective belt but powered by 3 AAA batteries with a 170 lumen max, more than adequate for road running and smoother trail running, especially when combined with a headlamp. Both Ultraspire Lumens are now in stock at Running Warehouse here. Use Code RTR10 and receive a 10% discount! All sales help support RoadTrailRun. Thanks! High Performance LED Headlamp with downcast and far reach lighting. Pelican is probably best known and renowned for their ultra-rugged military grade storage cases and industrial, public safety and mining lighting. My initial impression of the Pelican 2780 upon setup was that of top notch quality. The materials of this headlamp feel durable and high quality, from the headlamp, to the straps to the battery pack, all the way down to the wire connections. 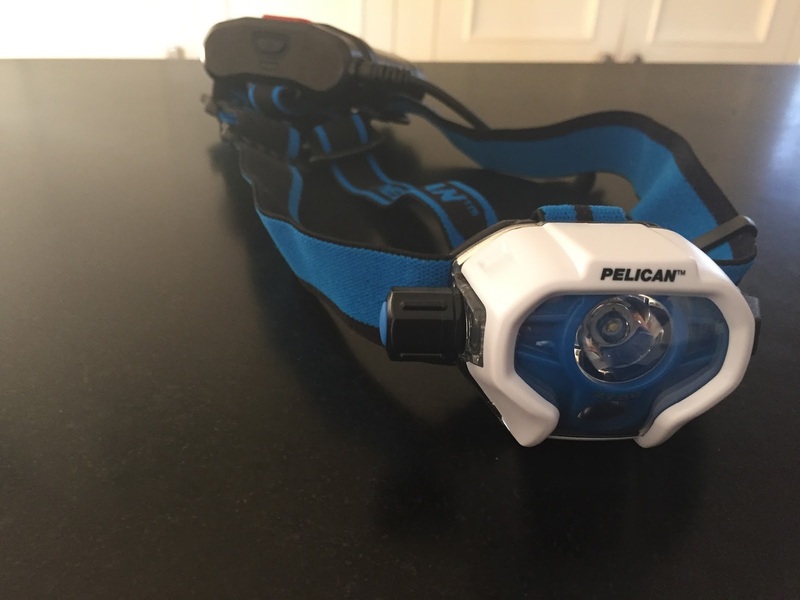 The Pelican 2780 is a somewhat unique headlamp, as it features both a long range beam as well as a downcast beam. These different beams can be used separately controlled by large black knob, or together at 3 different intensity levels, controlled by the large blue button. There is also a rear red light for added visibility, along with a choice of interchangeable covers surrounding the lens, white, black and glow in the dark. This light has a traditional elastic head band with over the head strap for stability and anchoring the rear battery pack. The rear battery pack requires 4 AA batteries (included) and is easy to open and close, with an obvious dial on the bottom. On the upper rear of the battery pack is a rear facing red light, with dedicated on/off button. 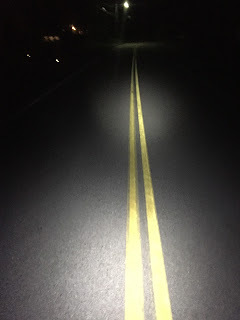 I like this idea, as I often add a rear facing, flashing LED bicycle light somewhere behind me while night running, but found that for it to be properly effective, this built in light should be a bit brighter and should flash. I also found this rear light easy to forget on after turning off the main headlamp (two separate actions). Also on the top of the battery pack is a battery level indicator, 3 small blue lights showing the level, but always seemed to read as 2/3 charged for me, even when I knew the batteries were new, so I paid little attention to it. The batteries were easy to install, but I found it somewhat difficult to remove them, either requiring the use an implement to pluck them out, or whacking the pack onto my hand to force them out. Many other headlamps with similar battery packs have been easier to remove the batteries. Not a big deal when changing batteries at home, but could be problematic in the dark and with cold fingers. The knob/switch for the main light is very intuitive and easy to operate, even with medium weight gloves. There are four different modes as you turn the knob, Main/Downcast, Downcast and Main, followed by Flashing. At the end of the knob is a large and easy to operate blue button that can be pressed to toggle between high, medium and low intensities on each one of the modes. At 430 max lumens, this light puts off an impressive beam and does a great job illuminating distant objects, excellent for route finding, navigation, or moving at higher speeds. 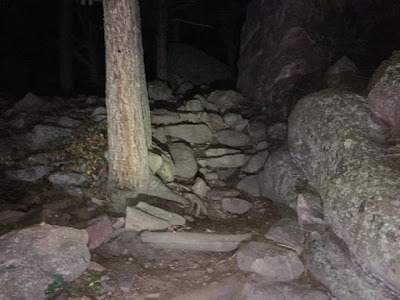 I appreciated the effectiveness of the dual beam action of the Main/Downcast mode, as it disperses light far and near in a way that was easy for me to feel well balanced and confident moving on technical terrain. I found myself inclined to use the Main/Downcast modes on medium or high almost exclusively and discovered that battery life on these higher levels are somewhat short, yet on par with the advertised burn times on the box (1:30 dual high, 3h dual med for what I was able to measure over several sets of batteries). Pelican claims a maximum burn time of 22 hours on the lowest downcast only setting. The lower light settings on this light are adequate and certainly sufficient if one is trying to get the maximum life out of the batteries, but on shorter night runs (an hour or two), I prefer the higher settings. When fully loaded with 4 double AA batteries, this is a somewhat heavy headlamp, but I found it to be quite stable, as it snugged up on my head effectively and there were no pressure points or discomfort, while the straps were very easy to adjust on the fly if need be. After a while, I hardly knew I had the light on my head and it did not wiggle or bounce, even on fast, technical descents. Like most (all?) headlamps, the lamp rotates downward so that you can optimize the direction of the beam to accommodate your illumination preference based on terrain/speed. The interchangeable covers that surround the lens seem somewhat pointless, but I did appreciate the glow in the dark option, as it makes it easy to find in the dark and would be handy when camping. The covers are not particularly easy to swap, so I would not want to do it often to suit my mood, I would just pick one and stick with it. Pelican also claims that this headlamp is waterproof to 1m, but I did not test that, I’ll take their word for it. Overall the Pelican 2780 is a very durable, bright, versatile and well-built headlamp for a multitude of adventures. Pros: Bright, intuitive and easy to use controls, multi beam feature, very high quality, comfortable, stable, waterproof. Both lights are outstanding and a choice comes down to preferences and needs. 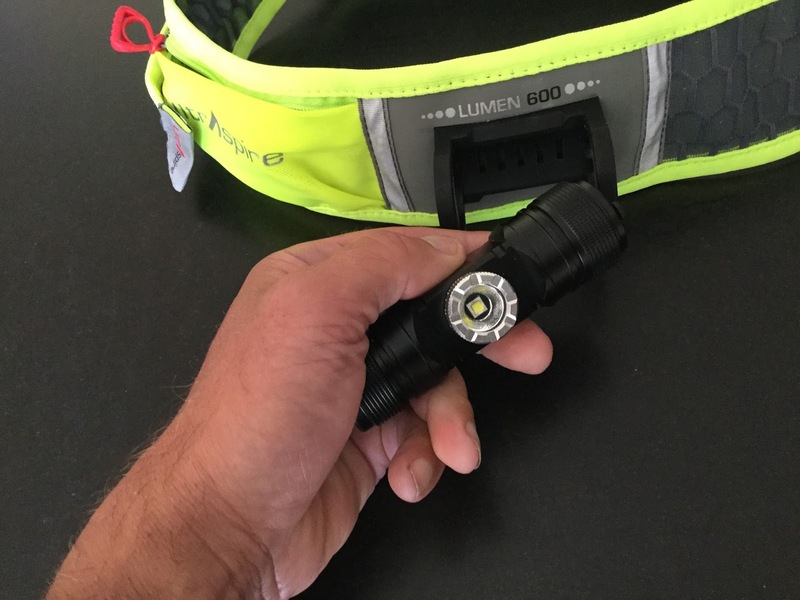 If you run primarily on roads either Lumen the 600 ($179.99) or the 170 ($99.99) with their down close light, pockets and reflective/high visibility properties are ideal hands free and lamp weight on the head free choices. If your runs are shorter in duration, or you don't mind carrying spare batteries, the Pelican can serve as your primary light for near and far, road or trail and is less expensive than the Lumen 170 or 600. Its rear LED blinker will also provide an added measure of safety. The Lumen 600 and Pelican 2780 were provided at no charge to Road Trail Run. The opinions herein are entirely our own. I curious, what is your favorite handheld light that you use along with a headlamp?